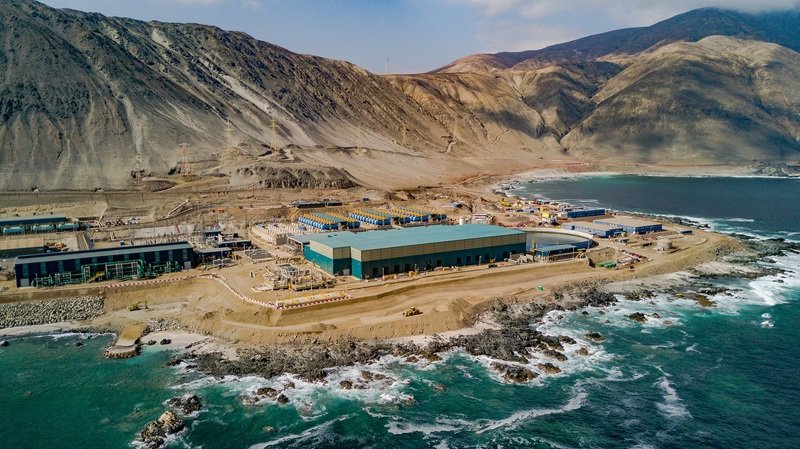 Minera Escondida, a subsidiary of BHP Billiton, has inaugurated the largest desalination plant in Latin America to supply the mine’s needs. The 25000LS plant is at the heart of the company’s water strategy, which consists of increasing the use of desalinated water and recovering more water from its processes as a means of gradually reducing withdrawals from aquifers. The US$3,430 million investment also included the construction of two 42” pipelines to transport the water to 3,200 metres above sea level, four high-pressure pumping stations, a reservoir at the mine and high-voltage electricity infrastructure to operate the system. Daniel Malchuk, President of BHP Minerals Americas, said that in order to ensure the electricity for pumping the water, BHP awarded a long-term contract for the development of the Kelar Power Plant, which was originally designed to use coal but was converted into a combined-cycle natural gas plant in order to have energy from a cleaner source. “This plant reflects our deeply held belief that it is possible to practice sustainable mining, which is both an ethical imperative and a fundamental condition for the business,” he continued. Mauro Neves, President of Minera Escondida, said the construction of the plant required 45 million man-hours of work. “At present, we are operating three concentrators simultaneously, an unprecedented situation in the mining world, giving us a greater processing capacity with which to maintain our copper output,” he added. Located 170 km southeast of Antofagasta in Chile, Minera Escondida is a mine owned by BHP Billiton (57.5%), Rio Tinto (30%), JECO Corporation (10%) and JECO 2 Ltd. (2.5%).